Attract the attention of the right customers at the right time with our innovative teardrop flying banners. You can use our teardrop flying banners for indoor or outdoor advertising. Our striking, long-lasting and visually-attractive teardrop flying banners are popular among our customers. 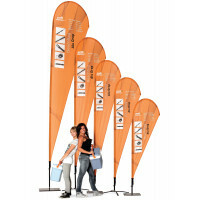 These banners are portable, attractive and cost-effective. These lightweight weather resistant teardrop flying banners are easy to assemble without using any specialised tools and mounted on heavy duty carbon fibre poles with a choice of mounting accessories. 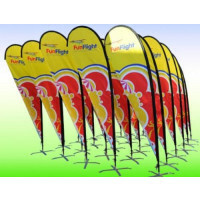 The teardrop flying banners can be custom-printed in 3 sizes and can be used with poles mounted on wheel bases, ground spikes, cross bases or water bags. The accessories for the teardrop flying banners can be stored in black canvas bags provided for the purpose. 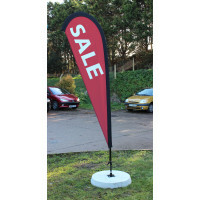 Browse through our range of teardrop flying banners to locate the outdoor display equipment of your choice.